Discover How I Was Inspired To Create The Awakening Self Help Kit And How It Continues To Help Me! Read about how I created the Awakening Self Help Kit self-empowering tool. This is the step by step story of how I came to create the Awakening Kit. On this page I outline the various stages of how the Awakening Kit came into being. I’ll go through how I was inspired to create it, the actual process of creating it and how it continues to help me in my daily life. If what’s being said on this website resonates with you then, for you, this particular life experience is about waking up and remembering who you really are. Thus, by the same token, if you feel attracted to the story of the Awakening Kit creation and you have the desire and the willingness to awaken to the realization and truth that you’re more than you’re currently consciously aware of, then this inspired tool is definitely for you. Because the Awakening Self Help Kit will assist you to bring many different areas of your life into balance and harmony, guaranteed! I first gained all of my spiritual and metaphysical knowledge by reading hundreds of books over a period of about 20 years; however, unless we are surrounded by like-minded people its’ easy to slip back into patterns of behavior that don’t serve us. Many years ago I experienced the dilemma of remembering the new (for me) truth about the nature of existence. You see, when you are surrounded by people who have been taught, conditioned and now believe that reality is one way without realizing they have it all backwards, there's very few people to confirm your ideas and insights. The game of life is played so you can remember who you really are from another perspective. To help me with this dilemma I came up with and coined the phrase "Remember to Remember." This phrase then became a mantra that I referred to often. It was also used extensively on the old version of this website. You see, by continuing to remember how reality really is and allowing the Universe to prove it you through your experience, your life changes in a variety of positive ways. For instance: no longer getting sick, having more money and enjoying fulfilling relationships. In addition, over time, you also begin to realize that due to ALL reality being "here" and "now" there's really nowhere to "get to," so you begin to relax and enjoy your life. The more you remember the more consciously aware you become! Before continuing with the story of the Awakening kit creation, I'll outline the kind of things I wanted to remember. Just like nearly everyone else I was conditioned to believe in many false truths concerning life, reality and existence. It's not that everyone involved in disseminating erroneous information did so from a negative perspective. Just like us, most of these people were also taught false truths by their own families and by society in general. I was taught that there is disease that's "out there" and therefore it is something you can catch! I wanted to remember that all reality is contained within us, there is no outside. I knew it was still possible to experience any disease, but it's created by US via our beliefs, thinking and behavior aka our state of being! I experienced a mixture of very good and very poor finances with no apparent rhyme nor reason! I wanted to remember that "what you put out is what you get back" aka the Universal law of attraction. Thus I needed to focus upon what I wanted without also focusing upon what I didn't want! I used to always complain and I didn't really appreciate anyone or anything! I wanted to remember to always appreciate and love everything currently in my life! I felt self-pity, was unhappy, quite angry and I didn't feel good as I was often sick! talking about my past aka the "poor old me" story. I wanted to change my story to one I preferred! My romantic relationships were very poor! believed that then and only then would I see a different reflection in the mirror of my life experience. As I'd been fully conditioned by believing in dis-empowering ideas all of my life, changing these beliefs did not happen overnight. Because we live in a time-space reality all change in experience takes time. However, the sooner we remember truth the sooner our experience of reality changes, hence my desire to Remember to Remember. A natural continuation of my mantra "Remember to Remember" was a process of receiving inspirational guidance which resulted in the creation of the Awakening Self Help Kit. Several years ago whenever I was happy, feeling good and relaxed I began receiving many rhyming messages from out of nowhere. I got into the habit of promptly writing the messages down and before long I had a collection of hundreds of spiritual, awakening and self help messages. During those times I wasn’t thinking about anything in particular and I certainly wasn’t "trying" to create poems or spiritually awakening messages. I was simply enjoying myself and happily going about my daily life. I believe this guidance happened due to all of the time I'd spent working on myself and my ego. My mind was now free from worry, doubt and internal dialogue, thus there was an opening or a "space" for what wanted to come through to me to do so. As you know, I love exploring life and the true nature of existence. Due to that fact I found many of these messages to be truly self-empowering and noticed that I was using them as easy "mind mantras" that assisted me to remember certain truths about life and the nature of existence - the subjects of my passion. After using these spiritually inspired awakening messages for more than one year, I began to wonder why they kept coming through to me. Then one day, in a flash of inspiration, I just knew that I had to create a self help product that can assist anyone who’s attracted to it to become more consciously aware, thus the idea of the Awakening Self Help Kit was born. The reason I was inspired to create a screensaver / slideshow product was because I'd previously had a lot of success in manifesting things I wanted by adding images of my desires to a screensaver I created. You can read about that idea on this law of attraction LOA (3) free self help article page. When you see the objects of your desire often while maintaining a good feeling state of being, it can serve as confirmation that manifestation is imminent. This in turn serves to raise your vibration further, again speeding up the attraction process! Once I'd decided upon the idea and before I could consider creating the screensaver, I first had to find an artist / graphic designer to put the inspired messages together with the images in my head into a usable format that was suitable for computers. You see, I'm neither an artist nor a graphic designer so I had to contract someone to do this work for me. Over the course of about one year I worked with a graphic designer to bring the ideas in my imagination into physical reality. This was sometimes quite difficult because the designer didn't necessarily see my ideas or even agree with me. Eventually, after much trial and error I was satisfied with both the image ideas and the layout of each of the 50 Awakening Images. My next task was to create the Awakening Screensaver. A few of the inspired images that came to me. In order to create the Awakening Screensaver I had to research and find screensaver creation software. After some time I found and purchased the software from this company: iscreensaver.com. The next step was learning how to create the screensaver using that software. This was a fairly slow process as I'd never created a software product before, let alone an online self help software product. After a month or so I was able to create the screensaver as I imagined it to be. At some point while creating the Awakening Screensaver I was again inspired by spirit to also create an eAlbum. I already suspected that some of the spiritual messages might not be readily understood by all people. So I knew it was a great idea to place the inspired images into an eBook together with expanded explanations for those people who needed them. The next step was creating the eAlbum. Although technically it's an eBook it's focused upon images. Once again I had a new challenge. Not only had I never written a book, but neither had I created one in PDF format. This time I carefully wrote expanded explanations for each of the 50 inspired messages. I think this took a couple of months because I was also working in a non-related business, so worked part time on the eAlbum. As I'd already completed the Awakening Screensaver it made sense to title the book Awakening Words. The next step was to contract a graphic designer to do the layout of the text and images. This ended up being a combined effort as it was sometimes difficult getting it exactly as I imagined it, so I did some of that work myself. It was a great learning curve and I've been able to use the knowledge gained to create other PDF files for use on this website. Two of the pages from the smart phone version Awakening Words eAlbum. 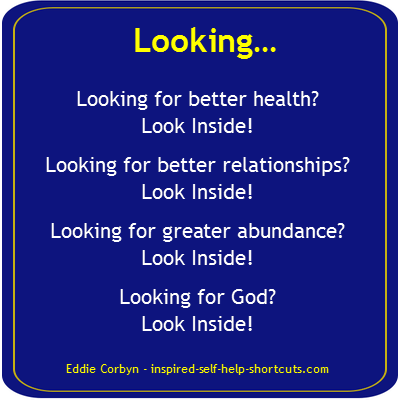 As I'd already created the Awakening Images for use in both the screensaver and the eBook I was inspired to include them as part of a self help kit package. Therefore, I've bundled fifty Individual High Resolution (1280 x 920 pixels) JPG images for use with PC, Mac and Smart Phone. One of the beautiful messages from the inspired images collection. 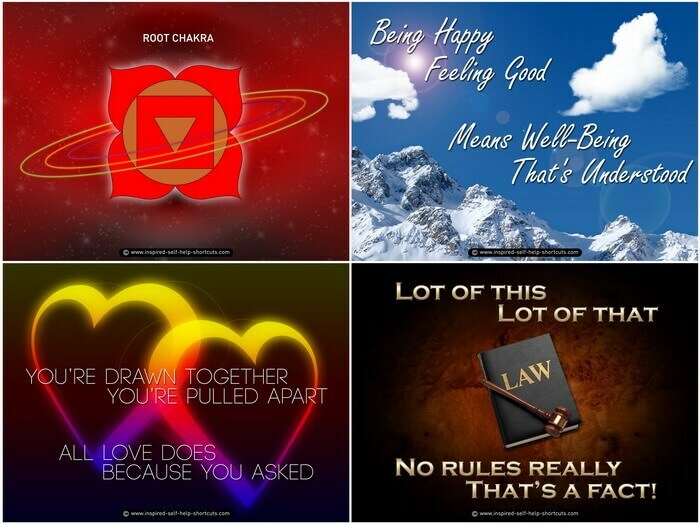 The Awakening Images contain timeless messages that focus upon the five main areas of: enhancing spiritual awareness, achieving and maintaining the state of well-being, attracting and manifesting abundance, relationships (soul connections), and understanding and balancing the chakra energy centers of your body. The Awakening Kit has been updated for 2019 to include Smart Phone users. This self help kit package is a tool that’s designed with several purposes in mind: each person who uses it will have the opportunity to gain more spiritual awareness and understanding, experience true well-being, find harmonious relationships and enjoy financial abundance. That is to say, they can awaken in all of the important areas of their lives, in the timing that’s right for them. 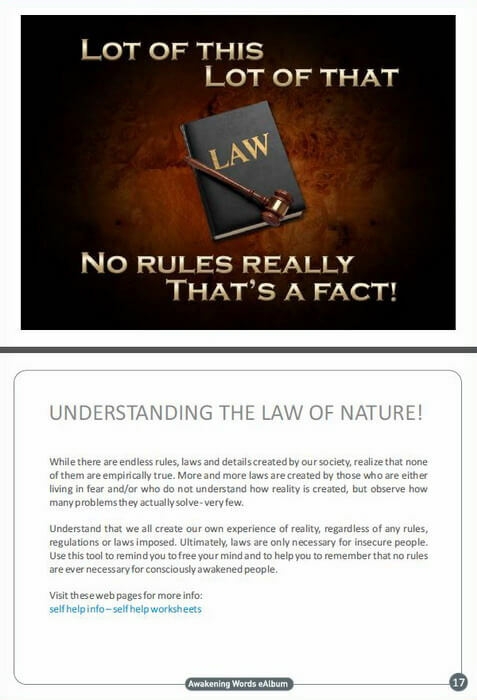 If this idea resonates with you then please check out the Awakening Kit by visiting this self help software sales page. Anyone on the path of self-discovery who feels challenged to remember the true nature of existence will find the Awakening Kit invaluable. If you are attracted to the idea of the Awakening Self Help Kit then it can definitely help you. This is because when you're attracted to any tool it acts as a permission slip that you give yourself in order to remember more of who you really are! When you use the Awakening Self Help Kit package you’ll be reminded of many timeless Universal truths that have always been there waiting for you to discover them! Please Note: For software support questions, please visit the Awakening Kit SelfHelp Software Page.